As is my wont I put off going to this wonderful exhibition and therefore queued with many other procrastinators on the last day. Cressida Campbell's woodblocks appeal to me on so many levels. 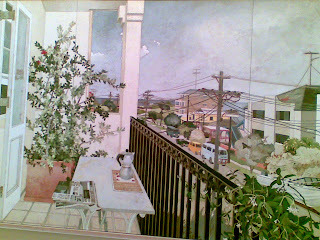 Her crisp lines, translucent hues and seemingly mundane interiors have been a favourite since the the 90's when I cut out a mgazine print of From The Balcony and stuck it on my notice board. This tattered paper finally fell apart last week so I resolved to see the originals and if possible buy a copy of her recently published book. Over a career of almost 30 years there has been surprisingly little written about Campbell, most probably because she does not produce work that fits the rhetorical blueprint of our times. In other words, she does not employ obvious themes, theoretical or political ideas, making it hard for shallow people to find much to write about. However, one need take only a little time to look, and there is no space to say all that might be said. 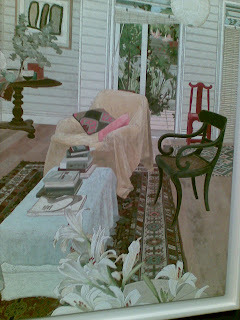 When I look at her images of 'pedestrian' scenes of a room or a balcony I am inexorably drawn into her space. Her colours relax me and even a simple image of nasturtiums draw my eye with their compact perfection. Images taken with a mobile phone do not do justice to these wonderful artworks but I am very glad that I did make it to the Sam H. Ervin Gallery to see them live. Thanks for introducing me to another wonderful artist. I was about to ask if you managed to buy the book and then saw from the link that the first edition sold out. It had excellent reviews. 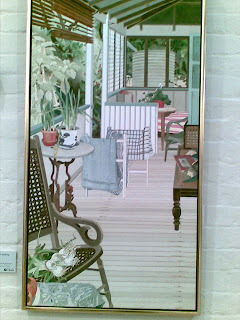 I have a long-held attraction to Cressida Campbell'a work. I love wood-blocks and I love domestic interiors. I've managed to miss this exhibition - thinking I had lots of time and then missing it because my last couple of weekends were busy. Thanks for the post.